Timber frame design-build - Veteran timber framer, timber frame crews, timber frame contractor, timber frame representatives, timber frame business council member, timber frame guild member. Our mission is to be a high quality timber frame company that provides impeccable personal service and high quality timber frames to its customers. We strive to carefully listen and understand what our customers want in their custom timber frame. Jeff is a veteran timber framer since 1989. Jeff began his career as a conventional builder in 1979 but soon discovered that his passion and skills were deeply rooted in the craft of timber framing, where detail and precision shine. Jeff ‘s experience in both the conventional and timber frame world is invaluable especially when working with homeowners on a hybrid project. Often we need to work with conventional builders on a timber frame project and Jeff’s experience in the conventional building world helps us to more effectively communicate for the overall project. We pride ourselves on getting to know and understand what our customer’s desire in their timber frame. We listen to the homeowner and visit their home’s location to thoroughly envision the conceptual design before we try to capture it on paper. Timber frames are very special structures and are uniquely designed to our client. We can design your timber frame based upon a variety of styles, traditional to very contemporary and everything in between. If you like an extra bit of flair in your frame we can dress it up with chamfer edges, hammer beams, gunstocks, engravings, pendants, etc. to make your home even more personal to who you are. 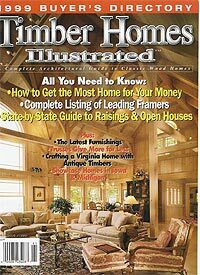 Several of Jeff’s past timber frame homes were featured in Timber Home Illustrated magazine. Signature Post & Beam is located at 3500 Freedom Street in West Liberty, Iowa. West Liberty is six miles south of Interstate 80. Take Exit 259 (West Liberty exit) and travel south on Highway X40 into town. Continue south by turning left onto Highway 6 (Columbus Street). Merge onto Highway 70 at the intersection on Columbus Street and continue south for approximately 1.5 miles. Turn right onto Freedom Street – we are the first building on the left. Signature Post and Beam, Inc. is offering an opportunity, in limited geographic markets, to anyone who is qualified to be an Independent Representative for our beautiful timber frame homes. Please contact us for more information on this opportunity. Call 1-563-260-1124 and speak to Jeff directly, or email Jeff at jrtimbers@gmail.com. The barn is finally being completed now. I wanted to thank you for a job well done. This was the first time I ever custom designed a structure and it was very challenging but rewarding. The suggestions you made during the design phase were very helpful, the extras were reasonable, and the frame was done as you promised. The workmanship is excellent – great looking fir, pine, and cedar. I was amazed that you set the whole frame in one week – in bad weather. I have gotten many compliments on the “barn”. But most importantly it is what I was looking for – a very unique structure that my family and I will enjoy for a long time. I am told by several people there is no other barn like it in Door County. Thanks again for your help, timely manner, and most importantly great quality. I’ve mentioned your name to several people who have stopped by who were interested in a unique post & beam structure. Best price. Fast. High Quality. Great Customer Support. I've talked Signature Post and Beam up to all my friends and will continue to do so. Highly recommend their timber framing to any home builder. We are finally in our new home. The house is very comfortable. When we started this project we wanted a unique house to fit our rural location. We did it! Thank you for your part in making this a beautiful home. We are extremely satisfied with our custom designed home. Our experience definitely exceeded our expectations in terms of quality and service. We feel very comfortable recommending you to others. We are truly blessed to be living in the "Home of Our Dreams!" We are very pleased with the house and the quality workmanship in our post and beam structure. We were grateful for Jeff helping with the erection of the post and beam structure. From the start, with your guidance and help throughout, beginning with the initial visit to our home site, providing expert architectural help, having discussions on the type of wood to use, it has made for a very satisfying project. If we decide to construct another one, you can be sure your company will be first on our list. Signature Post & Beam, Inc. works with customers all over the United States. We have a series of Independent Representatives who can assist you in your timber frame project. We want to provide personal service in all aspects of the timber frame process. Many timber frame companies will put a frame on a truck and ship it to the site leaving the homeowner to figure out how to build the timber frame on their own. Signature Post & Beam has its own crew to raise your timber frame. If you choose to have your General Contractor raise your frame, we will come to your site when the frame arrives in order to answer all questions and supervise the raising of the frame. Our goal is to make sure you are very pleased with our timber frame when the last peg has been driven. We are always showing a timber frame project at some location in our market. We would love to show you some of our work so please either call, write or email us to find out when and where we are showing our timber frames. Visiting a timber frame is a great way to get ideas for your own project, learn more about timber framing in general and see our quality work. We also are happy to have you stop by our shop to see our facilities. Our shop is located at 3500 Freedom Street, West Liberty, Iowa 52776. We are approximately 50 miles west of the Mississippi River and 6 miles south of Interstate 80. Please call or email us to set up a time to stop by. Signature Post & Beam, Inc.